Kaiser Fung (JunkCharts): "The field of data visualization has developed separately under three academic disciplines: design, computer science, and statistics. Inevitably, the work products contain contradictions and much re-invention. Cairo achieves a synthesis of these schools of thought, and this book is the clarion call for more work on unifying the key intellectual threads of the field." Stephen Few (Perceptual Edge): "I suspect that The Functional Art will be the premier work on infographics for many years to come." Nathan Yau (Flowing Data): "There's a growing number of books on information graphics, and many are written and illustrated by people who don't have much experience displaying information, which leads to art books posing as something else. This isn't one of those books. Cairo knows what he's talking about." The Guardian Data Blog: "The Functional Art is a comprehensive guide not only to how to do it; but how to get it right, too. 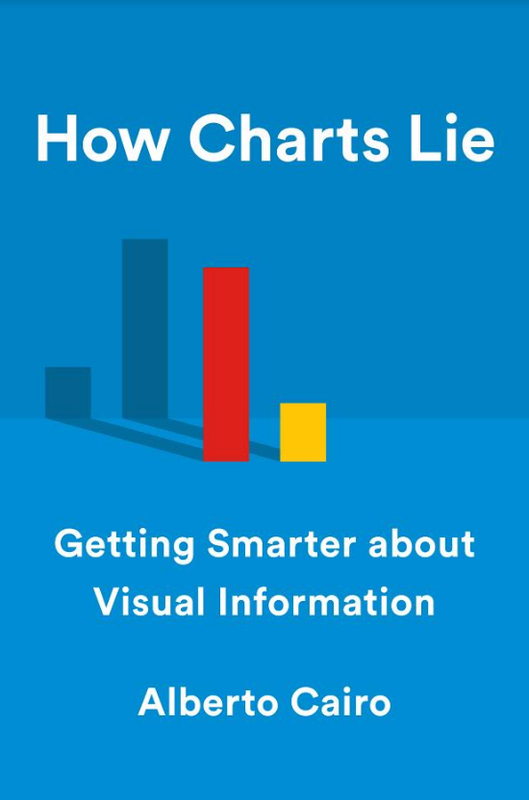 And, if you're interested in data visualisation, you must not only read this but absorb each of the lessons he teaches so patiently." Robert Kosara (Eager Eyes): "Read It. There is really nothing else to say. 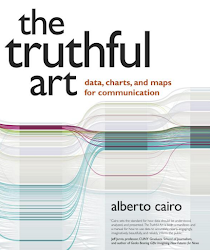 If you care about how visualization is used to communicate to people, this is the book for you. If you’re a journalist, you need to read it. If you’re an academic doing visualization research, you really, really need to read it. This is the stuff we’ve been missing in visualization for the last 25 years." Andy Kirk (VisualisingData): "When you read the book – and if you know or have met Alberto – you can’t help but hear him talking. It’s akin to an audio book without the audio. His personality and passion for the subject leaps from the page, maintains a momentum and keeps you turning the pages. The clarity of his conviction is also very impressive but not stylistically ‘oppressive’ - this is no preacher’s book. The book has gravity in the sense that you feel you are in safe hands being guided through this subject by somebody who has the necessary depth, experience and knowledge to pull it off." 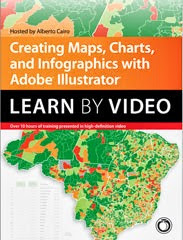 Nick Diakopoulos (Musings on Media): "Basically I see this as the new default book for teaching journalists how to do infographics and visualization. If you’re a student of journalism, or just interested in developing better visual communication skills I think this book has a ton to offer and is very accessible. But what’s really amazing is that the book also offers a lot to people already in the field (e.g. designers or computer scientists) who want to learn more about the journalistic perspective on visual storytelling." Bas Broekhuizen (Interactives): "Apart from the outstanding content it is this conversational style that makes this book a must-read for everyone interested in infographics and visualizations. Reading it is learning with a smile on your face." The Global Sociology Blog: "After having finished the book, you will never look at an infographic the same way again. You won’t be able to help yourself and do your little analysis of it and look for the properties explored in the book. Heck, I was doing that for class just today as I was looking through my series of infographics on global stratification, I kept wondering which ones told “the story” best for my audience of undergraduates, within a rough lecture format. I was also thinking of all the possibilities of assignments that would involve students exploring some interactive infographics and find their ways through them." Connie Malamed (author of Visual Language for Designers): "It is Cairo’s fascination with the convergence of visual communication, cognitive science and journalism that draws me to his work. He seamlessly weaves this passion into his book. (...) The Functional Art is a comprehensive book. It unfolds. Written with a clear voice, you’ll find expert methods, fascinating stories and probing interviews. The author’s journalistic skills are evident throughout. It’s scholarly, practical and playful all at once." Spencer Barnes and Laura Ruel (Visual Communication Quarterly): "The Functional Art makes a significant contribution to journalism, information design, and visual communication in two ways: as a teaching tool and as a treatise on visual storytelling and the ubiquity of data (...) The rigorous discourse and depth contained within The Functional Art make it an excellent primer for students, researchers, and anyone interested in information graphics and the roles they play in journalism and visual storytelling." Cole Nussbaumer (Storytelling With Data): "As the subtitle declares, the focus of the book is information graphics and visualization. Alberto has a conversational, super accessible writing style. His research is augmented with his extensive experience in data journalism and the book is filled with illustrative stories and examples." Chiqui Esteban (InfographicsNews): "I read the spanish version and the sensation I had is that I was reading what I should have read when I was in my first years in this work." Iva Cheung: "Cairo’s text gave me a much deeper appreciation of the research, skill, and editorial judgment—not to mention the hours of labour—that go into making good infographics." Michael Bauer (School of Data): "The world of datavisualization seems to know two kinds of books: The books talking lengths about the theory of how to display information visually and the books helping you to visualize data in framework X. Rarely are there books addressing the third part: How to tell a story and how to convey Information to an audience. 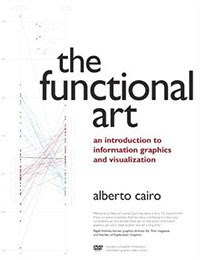 Lucky us, Alberto Cairo’s The Functional Art – an introduction to information graphics and visualization fills exactly this gap." Laura Norén (Graphics Sociology): "This diversity serves as an example of the breadth of Cairo’s experience in the world of journalistic information graphics. It is also a testament to his real joy in the subject. Many authors of design books are happy to fill the pages with their own work. Cairo is surely talented enough to have done. Instead, he chose to showcase an incredible range of designers and styles. This diversity, combined with the accessibility of the writing, are cause enough to recommend this book for anyone who is curious about graphics and journalism, especially journalism students." Sheila Pontis (Mapping Complex Information): "I enjoyed Cairo’s informal but highly informative and well-supported narrative style. Almost as you were having a face-to-face conversation with him or attending to one of his workshops, he unravels models and theories (e.g. Bertin’s, Tufte’s, Gestalt’s theory, cognitive principles) which might not be commonplace for domain-outsider readers." James Kirk (The Back Burner): "As an introduction to information visualisation the book is very effective. As well as guiding you through the good and bad, it provides a good base level explanation as to why so. In order to do so, it covers the basics of human perception and cognition and highlights ways to use knowledge on these subjects to make our visualisations better. As you might expect from a book on a visual topic, it is laced with images which are insightful and do exactly what the author would have wanted - help you, the reader to understand." Ole Munk (Ribergård & Munk): "Alberto builds up his argumentation carefully and logically and always tries to see problems from a reader's perspective which makes this book very useful, not least in an educational context. If I were to pick one quote, trying to distill the contents of this comprehensive volume into just one sentence - unfair as it would be, because this book contains much more - it might be this: "The role of an information architect is to anticipate the structuring process in the minds of our audience ... and generate order before people's brains try to do it on their own"."